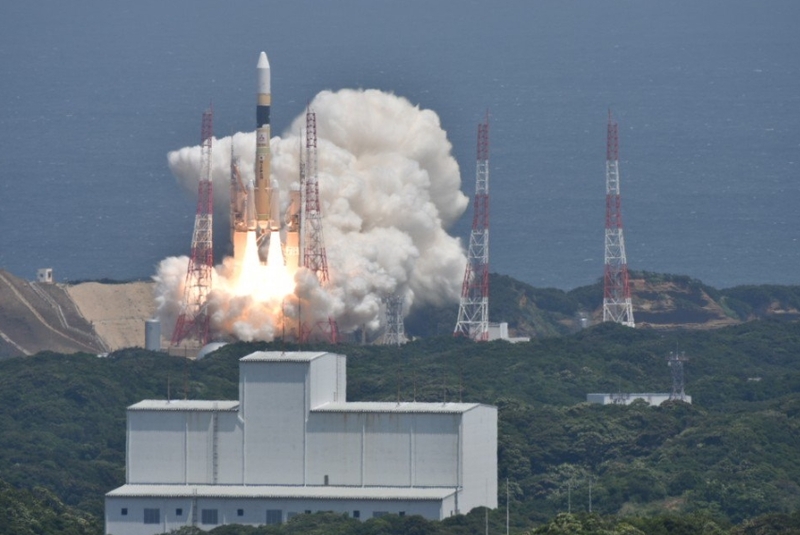 Japan made another addition to its constellation of reconnaissance satellites with the launch of the IGS Radar 6 satellite Tuesday. Riding to orbit atop an H-IIA rocket, the satellite lifted off at the start of a thirteen-minute, 57-second window that opened at 13:20:00 local time (04:20 UTC). The Information Gathering Satellite (IGS) program – also known as Joho Shushu Eisei (JSE) – consists of optical and radar-imaging spacecraft in low Earth orbit. The satellites are operated by Japan’s Cabinet Satellite Intelligence Centre, which conducts intelligence gathering for the Japanese military. IGS is also used to support civilian disaster management operations. IGS Radar 6, which was built by Mitsubishi Electric, is the sixteenth IGS satellite to launch – including both the radar and optical imaging branches of the constellation. Tuesday’s launch comes a little over three months after the previous IGS satellite, Optical 6, was carried to orbit by another H-IIA rocket. Japan began the IGS program following North Korea’s failed launch of the Kwangmyŏngsŏng-1 satellite in August 1998, which saw the North Korean Paektusan rocket overfly Japan. While the launch itself was unsuccessful, it proved that North Korea was capable of firing missiles that could reach Japan, prompting a need for greater monitoring and awareness of potential threats. The first two satellites – one optical and one radar – were launched on the fifth flight of the H-IIA rocket in March 2003. Another pair of satellites were planned to be deployed later the same year. However, the rocket carrying them was destroyed by range safety after one of its solid rocket boosters failed to separate. Replacement optical and radar satellites were launched separately, in September 2006 and February 2007 respectively, with the radar satellite sharing its ride to orbit with a prototype second-generation optical IGS spacecraft. The first operational second-generation satellite, IGS Optical 3, was deployed in 2009. The optical component of IGS entered its third generation in 2015 with IGS Optical 5, while the IGS Optical 6 satellite launched earlier this year was also a third-generation spacecraft. The radar-imaging satellites currently on orbit are of the type’s second generation: the first of which, IGS Radar 3, was launched in December 2011. Subsequent radar satellites were deployed in 2013, 2015 and 2017. 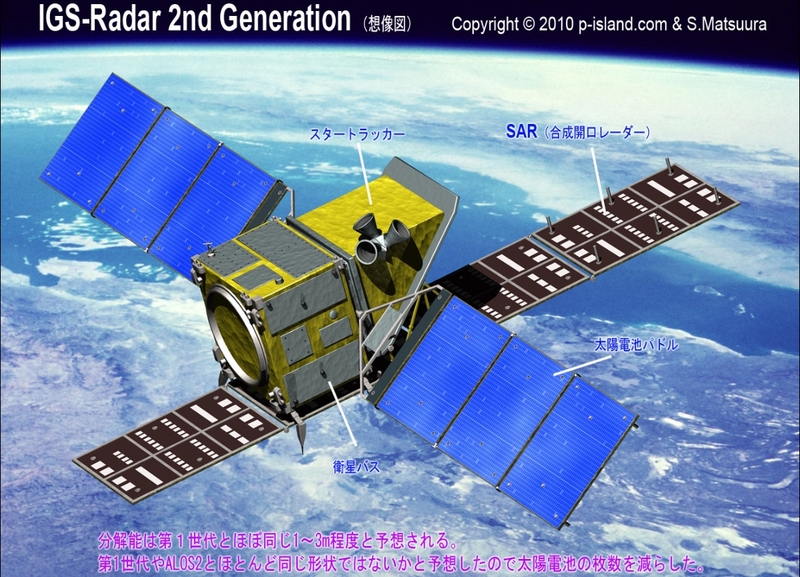 Japan has not announced whether the Radar 6 satellite on Tuesday’s launch is a fifth second-generation spacecraft, or the first third-generation radar mission. Although the satellite that launched Tuesday is numbered IGS Radar 6, it is actually the eighth radar-imaging satellite in the IGS series. This discrepancy arose as the result of two satellites being numbered IGS Radar 2 – the original that was lost the 2003 launch failure and its replacement – and an unnumbered spare satellite deployed in February 2015. Tuesday’s launch was the thirty-ninth flight of Japan’s H-IIA rocket – designated H-IIA F39. Built and operated by Mitsubishi Heavy Industries, the H-IIA was introduced in 2001 as a cheaper and more reliable version of the earlier H-II. A two-stage rocket fuelled by cryogenic propellants – liquid hydrogen and liquid oxygen – the H-IIA has been a workhorse for Japan’s space program carrying varied payloads, including military, Earth science, communications and interplanetary missions, to orbit. Depending on mission requirements, the H-IIA flies with either two or four SRB-A solid rocket boosters augmenting the first stage – two intermediate configurations, with two SRB-As and two or four Castor-4AXL boosters, were used before 2009 when upgraded SRB-A3 motors rendered them obsolete. Tuesday’s launch used two SRB-A3 motors, the most-commonly-flown configuration. The H-IIA has completed thirty-seven of its previous thirty-eight launches successfully. Its only failure was during November 2003’s launch, which resulted in the loss of the second pair of IGS satellites. 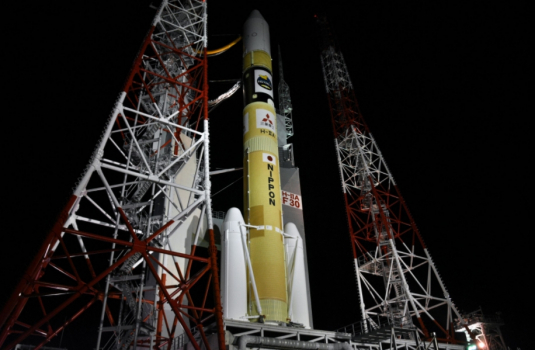 H-IIA launches take place from the Yoshinobu Launch Complex at the Tanegashima Space Centre. Yoshinobu consists of two launch pads – Pad 1 was built in 1993 for the H-II and subsequently modified for the H-IIA, while Pad 2 was constructed 200 meters (660 feet) to the west in the early 2000s to provide additional capacity for the H-IIA. All H-IIA missions have flown from Pad 1, while Pad 2 is now used by the larger H-IIB rocket. Final integration of the H-IIA took place in the launch complex’s Vehicle Assembly Building, atop a Movable Launcher (ML). The assembly building, located about half a kilometer (0.3 miles) northwest of Launch Pad 1, serves both pads of the Yoshinobu launch complex and can integrate H-IIA and H-IIB vehicles. H-IIA F39 was rolled out to Launch Pad 1 in the early hours of Tuesday morning. Under Japanese terminology, the zero mark in the countdown is designated X-0. The first stage’s LE-7A engine ignited two or three seconds beforehand, with the SRB-A3 solid rocket motors lighting at X-0, when the rocket lifted off under the power of its main engine and twin boosters. The SRB-A3 motors provided thrust for about 99 seconds, tailing off as they begin to deplete their fuel. About nine seconds after the boosters burn out, hydraulic actuators activated to push their spent cases away from the vehicle, reducing weight as the rocket continued its ascent. After booster separation, the H-IIA continued to fly under the power of its first stage for a further five minutes. Towards the end of the first stage burn, the rocket’s payload fairing – which serves to protect the IGS Radar 6 satellite from the dense lower regions of Earth’s atmosphere and to preserve the rocket’s aerodynamic profile – was jettisoned. Once the rocket reaches space, the fairing is no longer required and is discarded to save weight. About six minutes and 50 seconds after liftoff, the LE-7A engine shut down, its fuel expended. Eight seconds later, the first stage separated, with second stage ignition coming six seconds after staging. Powered by an LE-5B engine, the second stage likely made a single eight-minute burn to inject IGS Radar 6 into sun-synchronous orbit. Official word of mission success came later in the day. IGS radar satellites operate in roughly-circular orbits at an altitude of around 500 kilometers (310 miles, 270 nautical miles) and an inclination between 97.2 and 97.5 degrees. H-IIA delivered its payload close to its target orbit, with spacecraft separation occurring a few minutes after the second stage burn concludes. 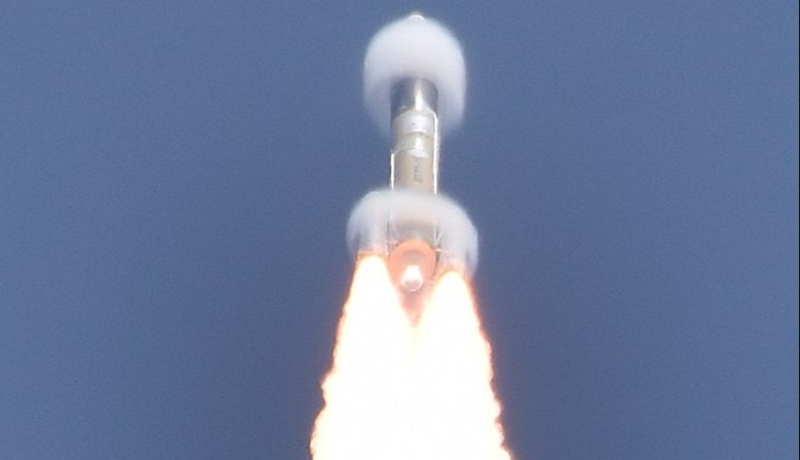 Tuesday’s launch was the fourth of the year for Japan and the second for the H-IIA rocket. Japan’s next launch is currently scheduled for August or September, using an H-IIB rocket to orbit Kounotori-7, the seventh flight of an H-II Transfer Vehicle (HTV) to the International Space Station. Another H-IIA launch, carrying the second Greenhouse Gases Observing Satellite (GOSAT), is also slated for later in 2018.